TIAMSA members receive a 25% discount and free shipping on the book upon check out until 31 March 2018. Please go to the MEMBERS ONLY Area to see all T&Cs. Taste is a well known but largely underestimated phenomenon. Yet it is one of the factors that has shaped our knowledge and view of art. Why is Rembrandt van Rijn today considered to be one of the greatest painters in European art while Gerard de Lairesse, Rembrandt’s younger contemporary and one of the best-selling painters of his day, is now forgotten? This book is a systematic and quantitative study of taste. More specifically it focuses on the painters of the seventeenth-century Low Countries and follows the changes in consumer evaluation of them from the seventeenth century up to 2008. Proceeding from the same starting point as Gerald Reitlinger in his monumental The Economics of Taste, it uses the prices paintings have fetched at auction as a basis for tracing trends in the taste of the art-buying public. 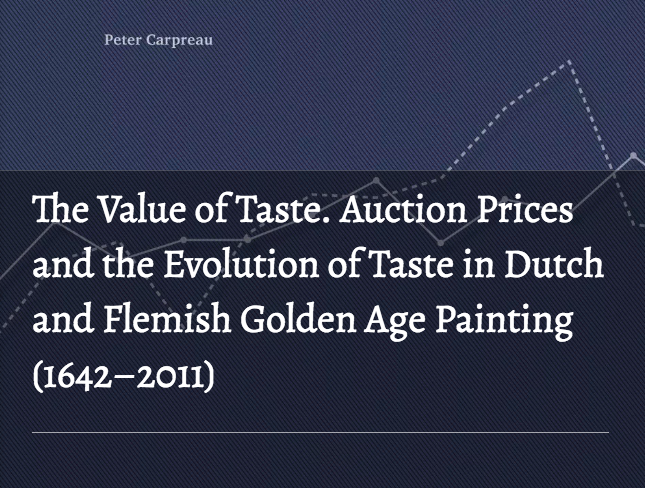 Whereas Reitlinger’s approach was rather intuitive, this study develops a sound methodological basis for researching taste and auction prices. It is not only quantitative methods and properties of auction prices that require a specific approach: in historical research quantitative data and analyses are only reliable when they can also be tested against qualitative or historical sources. Based on a statistical analysis, various ‘universal’ painters, such as Rubens and Rembrandt, are defined. In addition, however, specific genres such as landscape, portrait, history painting, and so on are analysed. In the case of eighty-three painters there is sufficient information to allow the profiling of individual price trends. But other quantitative data drawn from the examination of collections or catalogues raisonnés prove an additional source of information when compared with auction prices. This book shows what big data and statistics can mean to our understanding of art. Peter Carpreau studied Art History at the University of Leuven and the Sorbonne Paris IV. Today he is Head of the Old Masters Departement of the M Museum in Leuven.